Quirky Things Part 5 - The last of the series! This is the last in the series of Quirky Things....... I jotted these things down while I was in Habanero so I could share them with you. It's been fun to write and remember these events. 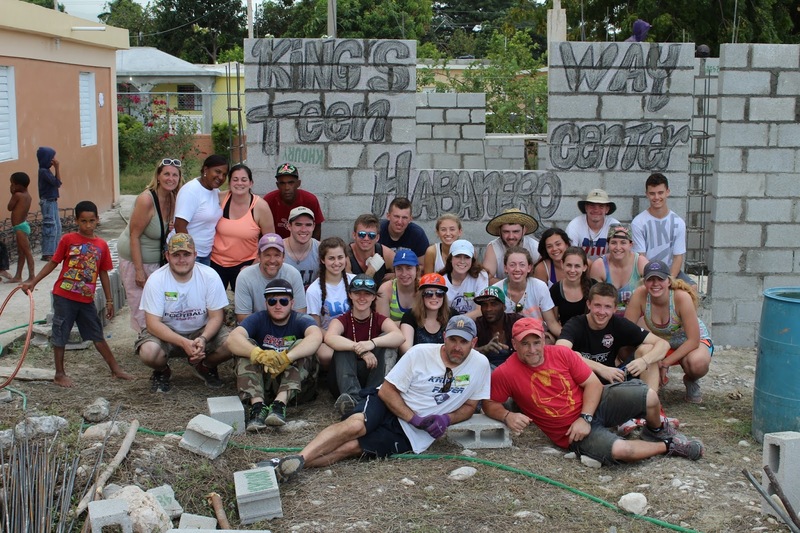 I hope you've enjoyed reading these blogs and it's shed a little light on life in Habanero. Here in America I have a few little things that don't work properly around my house but for the most part everything works as expected. Key word in relating to these differences is expectations! Mine are always different than the reality of Habanero. So you know when I go to Habanero to prepare for a team part of what I do is get everything up and running for the team as best I can. The tropical environment is hard on equipment and the quality of work plays into how things work as well. There are 3 things to fix on the doors. 1) There's just a padlock on the new door and the 2 pieces that you lock together don't line up well, so it was very difficult for me to slide them apart. 2) We need a deadbolt 3) We need a lock on the new bedroom door. Yanet arranged for a man to come do the work and he is well known and is "very, very good". 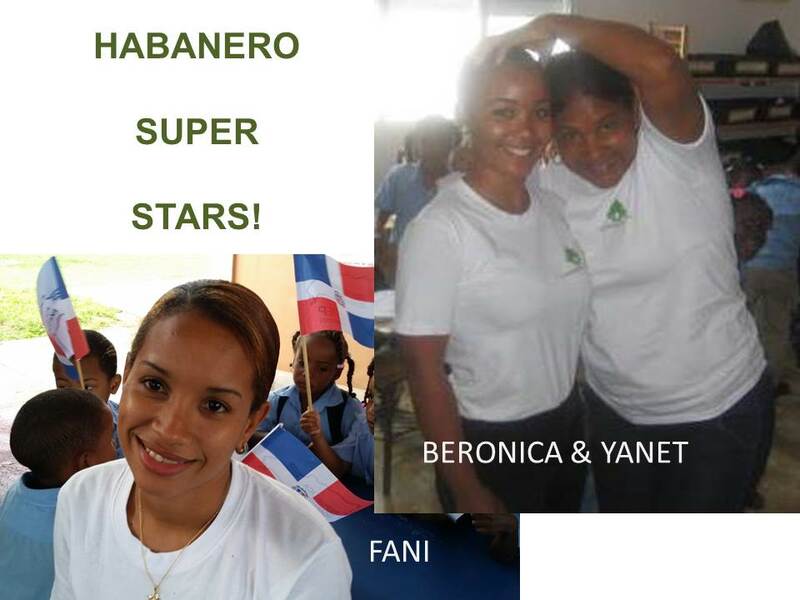 In Habanero there is no Angie's List, it's Yanet's List! He comes in the morning around 8:30am. He has to weld the new deadbolt on the door so he needs power. He hands me a cord through the window. I look at the end and there is no plug in just two stripped wires. I smile at him and motion for him to come in and hook it up. He puts the wires in the socket and welds the new lock. I ask if there is anything else he needs, he says no so I secure the rest of the house and leave to go to the school. A couple hours later when I return he is still working on the bedroom lock. It's 4pm by the time he is finished. I have supplied all the materials so I just need to pay for his labor, I ask him how much and he says 700 pesos. Approx $15 for him and his helper. He also had come to the house the day before to tell me what I needed to purchase for the job. So $15 for 2 men all day + an extra trip was reasonable. We say goodbye. Later that night Yanet comes over and we inspect the work. Hmmm....... the new deadbolt works perfectly but the 2 pieces that go together for the padlock still don't fit - I now actually need a hammer to smack them apart. We look at the bedroom door, lock looks good, but the lock doesn't actually lock. Bummer for us, because once you buy something in this country you own it weather it works or not. But don't get me wrong, I'm thankful for the doors and locks, we have no lovers and no poopers back there! 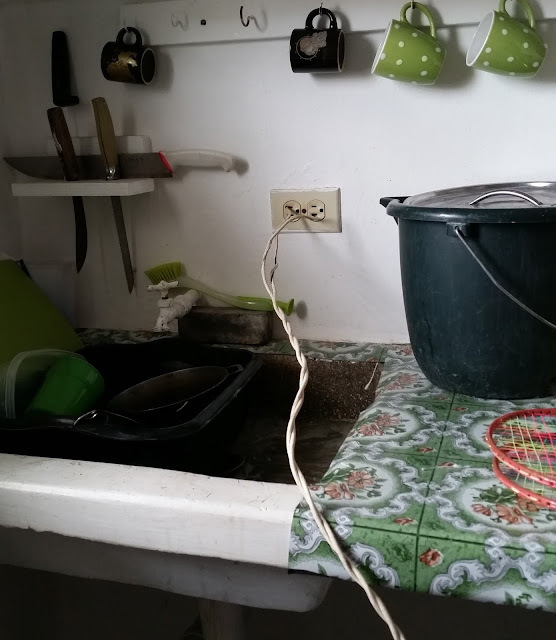 Among other things that didn't work on my arrival, the water tank on the roof overfills, the refrigerator didn't work, the washing machine was broken and one fan didn't work. As they say, welcome to the Dominican Republic! For you here in America "count your blessings!" One afternoon I was sitting on a white plastic chair in front of the colmado across from the mission house when Jose Luis walked by. He waved and then as a second thought he made a u-turn and headed straight for me. He took out a prescription from his bible and asked me if I could get the medicine for him. He said he's been sick with fever and diarrhea (both very common in Habanero). I told him I was sorry he was sick and I would see what I could do. I took the prescription into the house and put it safely in my purse. I then added Jose Luis' prescription to my "to do" list. Jose had never asked me for anything before so I assume it was legitimate. The next morning as I was going over my list I looked at the prescription again, I didn't know what it was for but I could see that it was dated December 5, 2015 which was over 2 months previous. Hmmmmm...... Red Flag! I made a mental note to speak with Yanet about this. I normally only purchase recent prescriptions. If the prescription is old and they are still sick I tell them to go back to the doctor and get a current diagnosis. So later that evening I showed the prescription to Yanet and told her I was concerned because it was from December. For those in the know, we have been working on the mission house little by little for a couple years now. Adding rooms so that it would be more comfortable for our mission teams and giving us some much needed storage space. When we began I wasn't really sure the WHY's were good reasons. I mean after all, weren't the Americanos pretty comfortable most of their life in comparison to the people of Habanero? Maybe it was meaningful to suffer a little while you served. And seriously? Did we really need more space for stuff? I wondered if perhaps we were turning the mission house into little America. At any rate, we've been working on it. It is wonderful I couldn't love it any more. 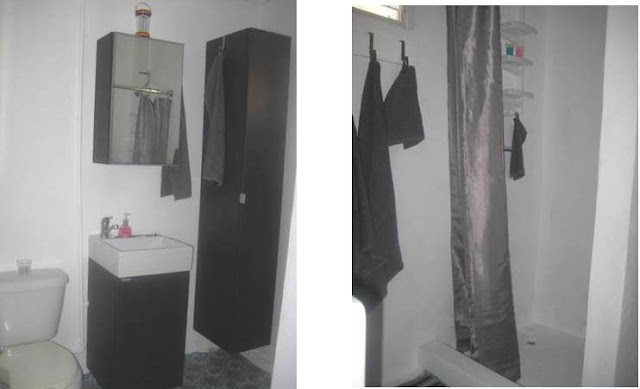 And the added showers and toilets have been very much appreciated. But that's not what this blog is about. 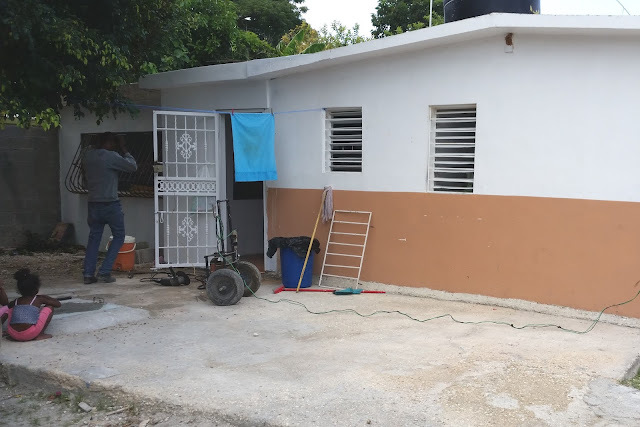 Last August when I left Habanero the roof had been put on the new kitchen and bedroom. Next step cement floor, so I left enough money for Yanet to have the floor finished in my absence. When I arrived in January boy was I surprised! Not only had the floor been finished, but metal bars had been put across the windows and door. The new space was secured! Yeah! That's a good thing, right? Well, the only problem was we owed money. No one was exactly authorized to put us in debt. But, at least they didn't sell the house, right? I speak with Yanet and learn that evidently some teens were meeting up and doing a little making out back there! lol Some things transcend international date lines. The teens were using it for love connections until it started to smell because someone else was pooping back there! lol A third world problem for sure. So Yanet had made the correct executive decision to secure the building. That's what we want her to do. Lead - and she did. She cleaned it up and secured it. During our conversation I also learned that we had a problem with the building. Evidently when it rained the roof leaked. I'm like WHAT??? It's a new roof. So we get the builder, Boika and I say hey you gotta fix the roof it's leaking. He says well, are you ready for this? "It will cost more money if you don't want the rain to come in. We need to build an overhang so the water doesn't come in." I think about that for a moment knowing I must be careful with my words. I look at the rest of the work he has done and sure enough the other walls have an overhang. So I say, well I'll buy the materials but I'm not paying any more labor. He says, you didn't say you wanted an overhang. It's not my problem. 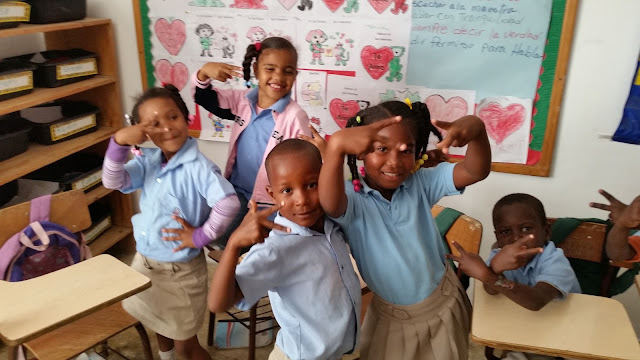 As most of you know Evergreen4kids and the school in Habanero have been trying to partner with the Dominican government for a couple of years now. We want a partnership so our staff will have all the government benefits and government employees have. Last August I thought we'd finally made some headway. After lengthy meetins we learned we had to submit an application in Santo Domingo and take an "official" name for the school. 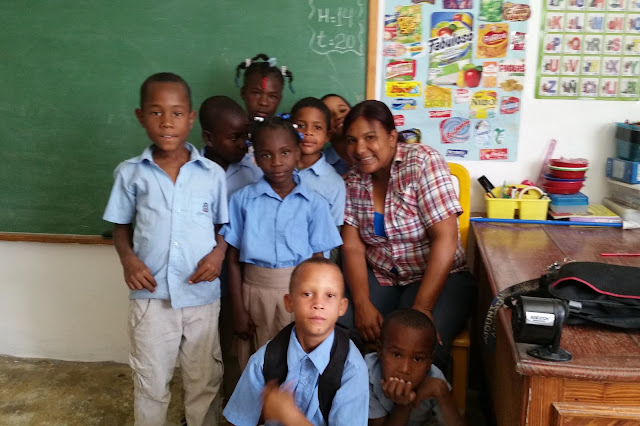 The official name would be "Instancia Infantil Habanero" this name was given to us by the secretary of the Director of Education in Barahona. Yanet, Carlucho and I are so excited! we drive to Santo Domingo the next day and file the papers. We go back a week later and have the official papers! Yeah! Next step more papers filed in Barahona. We are so excited, we make new t-shirts for the staff and signs made for the road. Isn't it beautiful? That was last August. When I arrived this February, I learned the word Instancia is spelled wrong. Now mind you, this name was written on a piece of paper and given to us by the secretary of the Director of Education in Barahona and we filed the name with another government agency in Santo Domingo. So it seems that sometime in December a man is driving down the road and he stops and starts asking people about the sign. He finally gets to Yanet and informs her that Instancia is spelled Estancia. We had to file and pay for new papers in Santo Domingo and submit them to the office in Barahona, who were all unaware that it was incorrect. I had to laugh.... only in the Dominican. This is a post about the quirky little things that happen in Habanero. It's such a different world than my ordinary, quiet life in Longview, WA. Sometimes I just have to shake my head and laugh. Since we had a large mission team coming to Habanero to build the Teen Center we had to purchase more plastic chairs. The chairs are a necessity in Habanero because we sit outside so much and the chairs are easy to move around. Plus they are cheap. About $10 each. Now you have to be careful with the chairs because not everyone can afford them and if you leave them outside they might grown another set of legs and run away. Over the years I've came up with the idea of spray painting the legs of the mission house chairs. That way it is obvious if someone else is sitting on a run-a-way chair. We had 10 black leg chairs and now we have and additional 15 green leg chairs. So one afternoon I am painting the legs of the chairs in the street when Temo comes over and asks if he can help me. I'm more than happy to let him help as I have a list a mile long on my to do list. I lock up the house and go over the school. An hour or so later I come back to the house and as I walk around the side of the house I see Temo's name spray painted on the cement blocks which will one day be the inside wall of the garage. I'm not happy with the graffiti. I see Temo, Maconi and Adrian across the street smiling. I go over and say, hey what's the deal, did I give you permission to paint my house? They laugh and point the finger at Maconi and say "he's an artist". Obviously they don't think it's a big deal and in fact think it is funny. So I say, yeah, I'm an artist also. How about I spray paint my name on the gas tank of your motorcycle? Temo looks at his beautiful motorcycle and says no, no, no. Adrian laughs and I say, Hey Adrian how about I spray paint my name on your grandmother's house? Would that be okay? Adrian looks serious now and says, no that wouldn't be good. I said no it wouldn't be good because it would be very disrespectful to paint someone's property without their permission, wouldn't it? The three young men 18, 20 and 26 years old hung their heads in shame. I kinda felt bad for a moment but I let that pass. They didn't have the right to spray paint on another person's property and it doesn't matter what country it is. There is a man in Habanero that has stolen my heart. Shhh...... don't tell my husband. lol Nah, it's not that way, but Ben Wai does hold a very special place in my heart. Ben Wai works in the fields in the Dominican Republic. He plows the land by hand. From the first time I met him I was impressed by his toothless smile and humble spirit. 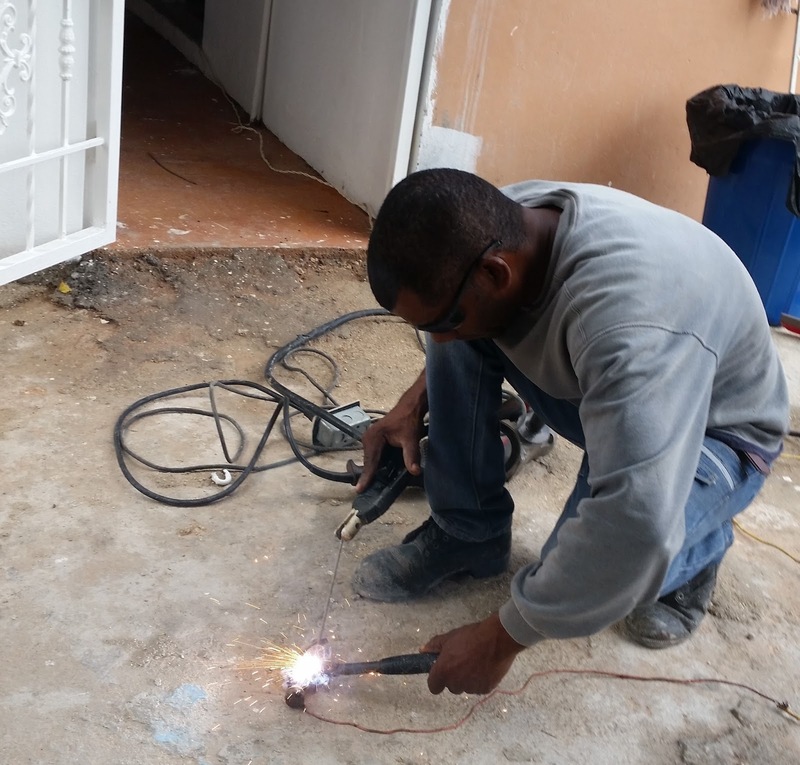 He came to the Dominican from Haiti to find work. He has been in the Dominican Republic many years now and his 3 children were all born in Habanero. Ben Wai stands out as a man of integrity to me. You see Ben Wai is extremely poor, but over the 10 years I've known him he has never asked me for anything. Not one peso, not one grain of rice. Impressive. I see Ben Wai every visit to Habanero. His family is usually a recipient of a bag of clothing. With each trip we take as many suitcases as possible. The suitcases are filled with school supplies, shoes and clothing. Sometimes towels and sheets if we have them. We have a list of all the homes and fill up a plastic bag for each home. We go as far as we can on the list and when we return we begin where we left off. I always think it really isn't so much WHAT we give to each family, it is that we REMEMBERED each family. Ben Wai doesn't speak English and my Spanish is for survival only! ¿Dónde está el baño? lol But I know he is thankful for what we do in the community. In February I learned how important that small gesture is. A girl in the village, and my future daughter-in-law (thank you Jesus) has learned to speak English. Her name is Lucy and we were together every day this trip. Wow! What an eye opener! We always have translators when we are working with a team, but when I'm there alone I usually wing it unless an emergency arises. I learned so much by having Lucy by my side and I appreciate her help so very much. Lucy, Ben Wai and I sat and spoke for about an hour and I had many questions. I asked him about his children, his wife, all the general things you'd ask. He said they were all good, healthy and the children were in school. All said with that great big toothless grin. Ben Wai is currently staying at a property Lucy's father owns in Habanero. Ben Wai stays there for free in exchange for "watching" the property since Lucy's father now lives in Barahona. It's 2 rooms with no bathroom but there is running water outside to bath. The water is not good, but they drink it anyway since they can't afford to buy water. There is one bed for 5 people and clothes are hung on nails pounded into the wall. They cook outside on an open fire. Life is simple he says they have everything they need. Ben Wai just smiles when he sees the shock on my face. He understands I come from a different world. I ask him what he does when he doesn't have enough money. He says sometimes if the plants are ripe, he asks the man if he can take some of the plantinos from the fields. Sometimes he will do an odd job for someone in the community and use that money to buy food. But mostly he gets credit at the local Colmado (store) in Habanero. When the man pays him he gives all of the money to the Colmado. He must or he will not get credit again. I ask him why he doesn't find another job even though I already know the answer. There aren't many jobs in Habanero, there's about 70% unemployment rate and it's worse for Haitians. Ben Wai is in the country illegally and never goes outside of the safety of Habanero. To do so would subject him and his family to possible deportation. So he works the fields and stays off the main roads. I tell him it seems like a very difficult life. He says it is a difficult life, but his children will have a better life. They are going to school. He tells me he never went to school and cannot read or write. But his children can! And there it is again that big toothy grin that shows a joy far beyond my understanding. He tells me he is thankful for the school in Habanero because his children eat there and he does not have to buy them uniforms to go to school. He is thankful for the bags of clothing we bring because he can use the money he earns to buy food for his family. Ben Wai also tells me of the hope he has to get papers for his children one day. You see they were born in the Dominican and therefore are Dominicans. However, without papers they could still be sent back to Haiti. He is trying to save the money necessary to get the papers. Which will be about 10,000 pesos. He seems so hopeful, but I do the math in my own head and know he will never be able to save the money. It is 5 months worth of work for Ben Wai. With every trip to Habanero it just never gets old, there is always something to amaze me. God is working in this place and I wish that you all could see the changes that I have seen over the years. One of the things Evergreen4kids is most proud of is the fact that from the very beginning we decided to only hire staff for the school from Habanero. We felt strongly the children needed to see people from their own community as leaders. The children needed good role models. Hiring within Habanero meant we had to find people that had an interest in teaching and were capable and committed. We found Yanet. She was volunteering at the nearby government school and taking one class a week towards a teaching certificate. E4K asked Yanet to volunteer at our school as well. She would receive an "incentivo" (an incentive) for volunteering. This arrangement is quite common in the Dominican Republic, they are not really an "employee" they are a volunteer. Yanet was happy and excited to work with us. Yanet was born and raised in Habanero and wanted a better future for the children. So Yanet began as our kindergarten teacher. At the same time we also hired 2 Christian ladies to teach 3 year olds and 4 year olds. One of them was Maria and she was also volunteering a the government school. But at that time Maria was not working towards a teaching certificate. Both Yanet and Maria now have their Dominican teaching certificates. Yanet is our school director and teaches the regular first grade class and an afternoon remedial first grade class. Maria is our kindergarten teacher. Yanet and Maria have both come a long way and are excellent teachers. They are loving and compassionate and the children look up to them. I can also report that we have two other teachers who are going to school to get their teaching certificates. Fani who is our 4 year old teacher and Beronica who is our 3 year old teacher. E4K encourages a better education for everyone. One of our maintenance men Omar, is going to school to be an electrician and our night watchman, Allen is going to school to be a PE Teacher! How exciting is all of this? Soon to have 6 people in our building with degrees! THIS IS HUGE FOR HABANERO! TO HAVE THESE PEOPLE AS ROLE MODELS FOR THE CHILDREN THAT WILL BE ROLE MODELS FOR THE NEXT GENERATION IS A GREAT GIFT FROM GOD ABOVE! I AM SO THANKFUL TO BE A PART OF EVERGREEN4KIDS! Good grief! As I get older I realize I need lots of help. lol I just ran across a blog I wrote a while back and I want to post it. The blog will be out of date, but I think it's important. I hope you do too! This morning as I come around the corner by the school I see our school Director Yanet and our 4 year old teacher Fani running out to the street. Yanet is waving her hands frantically at a man on a motorcycle who has just dropped his daughter off at school. Fani is behind Yanet with a small child who is obviously unconscious. Fani hops on the back of the moto holding the child and the man zooms away. Off to the hospital. As I arrive at the school I learn 2 boys were running and came around the corner of the school at the same time. Bam! They collided and one of the boys, Manuel, hit his head on the cement sidewalk and was knocked out. We prayed for the boy as he was being sped to the hospital. We also prayed for the other boy, Tico because he was very traumatized by the incident. Tico was crying so hard he was shaking. I believe he thought Manuel had died and it was his fault. Tico’s father arrived, consoled him and carried him back to class. Manuel’s father was alerted that Manuel had been taken to the hospital. In about an hour Manuel, his father and Fani arrived back at the school very happy that Manuel was now suffering from nothing more than a headache. We gave Manuel Acetaminophen to relieve the pain. Then we got Tico and Manuel together for a great big hug! Students and teachers were all happy that Manuel was okay and back at school just in time to eat! I write about this incident to show how very different things are in the Habanero. 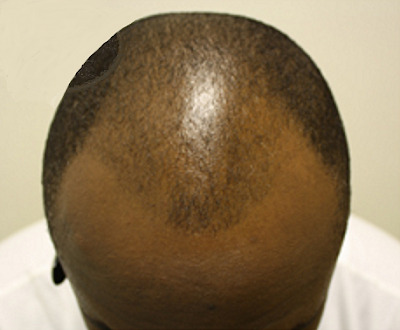 This was an unfortunate accident that was taken care of properly. From our staff, Fani & Yanet to the man on the motorcycle and to both fathers everyone went into action and did what was necessary for the sake of the children. There were no accident reports, no parents upset, no school board inquiries, no insurance companies involved. Both the boys were treated with love, compassion and common sense. I myself was impressed with the lack of coddling of the boys. They both went back to class and finished out the school day as usual without dwelling on the morning incident. How refreshing it was to see!